They’re like scissors with fins strapped to an endless appetite. 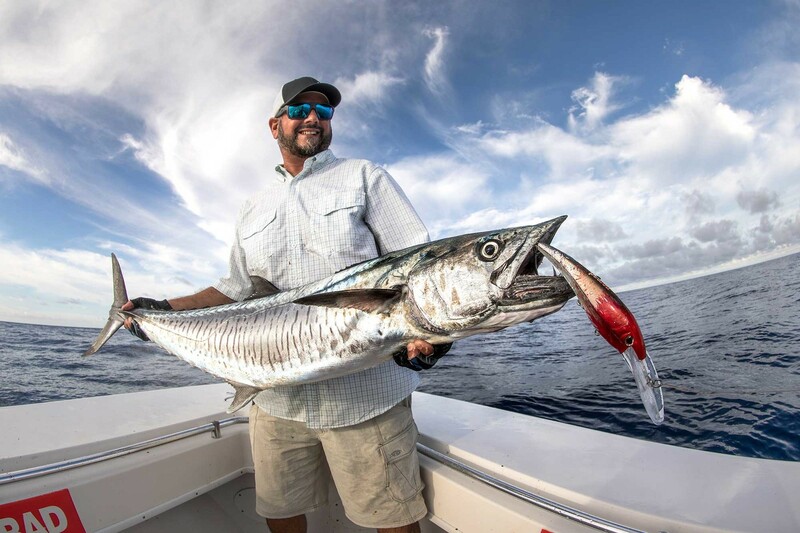 Indeed, as one of the most aggressive and voracious species in coastal waters, Spanish mackerel present a user-friendly target for anglers of all levels. Common throughout the Gulf of Mexico and along the Atlantic Coast to North Carolina, these speedy predators travel in large schools, which create a constant feeding competition and virtually guarantees a bite. The mackerel game is not complex, but a handful of details will keep you on track. Structure: Food is the key to keeping a mackerel’s attention, so focusing on the areas where baitfish congregate is the surest course to success. Artificial and natural reefs are some of your top choices, as their self-contained ecosystems hold a myriad of forage species, including the schooling baitfish such as threadfin herring and sardines. Other productive options include rock piles, ledges and shallow wrecks. Also, don’t overlook channel markers. Both fixed and floating navigational aids often attract schools of baitfish, that relate to the shadows. Water Influence: There’s really never a time when mackerel don’t want to eat, but these fish are strongly influenced by tide cycles. The fish can hunt during any stage of the tide, but when peak flow positions their prey in predictable areas, they definitely make the most of these prime feeding opportunities. Savvy anglers will leverage this truth by fishing their best spots when the tide’s rolling. Appetizers: Expounding on the previous point, a key element of Spanish mackerel pursuits is chumming. Options vary, but you can never go wrong with a frozen chum block held in a mesh bag and hung from a stern cleat. Water melts the block and current disperses the bits of ground fish in an oily slick that attracts mackerel and brings them into range of your baits. Some anglers supplement a chum bag by dropping chunks of cut baitfish or tiny glass minnows into their chum line. This can certainly help if the bite is tough, or if multiple boats are working the same spot. Just consider that once you stop the freebies, the school will likely move on to the next feeding opportunity. Sea Signs: Beyond the range of side-scanning sonar, it’s difficult to determine what’s happening below the surface. However, mackerel often give away their location through feeding behavior. For one thing, the fish often push bait schools to the surface and gorge on the trapped prey. Spotting white water explosions, slashing streaks and even leaping macks points you to the action. Birds will also help anglers locate mackerel by hovering over a feeding school and picking off the scraps. Even if there’s no immediate surface activity, consider a tight flock of gulls and terns flow low to the surface as a clear indicator of predators below. Rig it Right: Second only to its brilliant golden spots, the mackerel’s distinguishing feature is that mouth full of sharp teeth. Given their slashing style, their teeth often impact fishing lines during the attack and/or fight, so a wire leader affixed to a long shank Mustad Best Kirby Hook allows you to fish live baitfish without worry.